Eiko in Fukushima, Tomioka, July 22, 2014. Photo by William Johnston. Friday, March 11 at 4:00 p.m. until Saturday, March 12 at 10:00 p.m.
March 11, 2016 marks the fifth anniversary of the earthquake, tsunami, and nuclear disaster in Fukushima. After Fukushima: A 24-hour Event is curated by Judy Hussie-Taylor and Lydia Bell in collaboration with Japanese-born dancer and choreographer Eiko and will include a photo collaboration between Eiko and photographer/historian William Johnston, which will be on display in the sanctuary for 24 hours beginning at 10:00 p.m. on March 11. 4:00 p.m. until 5:00 p.m.
5:00 p.m. until 6:00 p.m. 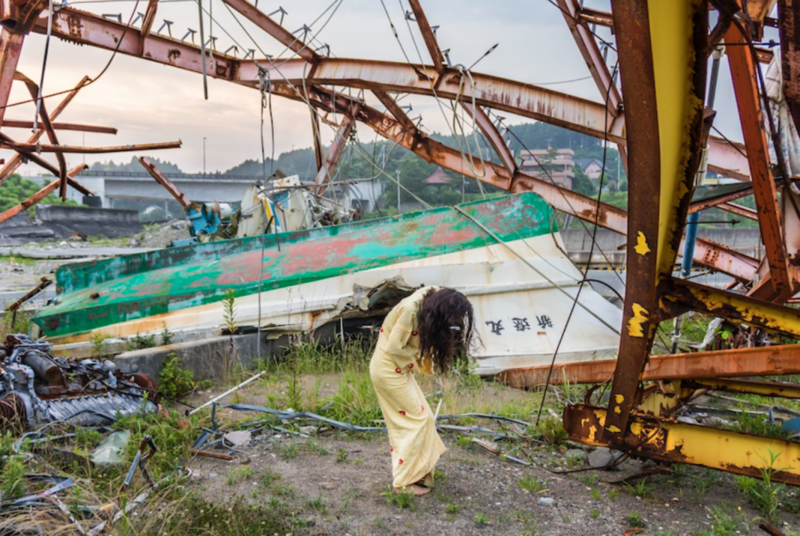 The Church will be open for 24 hours to visit the Eiko/Johnston “A Body in Fukushima” photographs while singers and poets will mark each hour. Saturday, March 12 – Exhibition closes at 10:00 p.m.
For more information, visit Eiko and Koma’s website; to RSVP and to purchase tickets, please visit Danspace’s website. Saw this event posted at http://www.enenews.com, which has done an amazing job of reporting on Fukushima from Day One.